Carson Wentz got hurt, in case you were unaware. Now that the Philadelphia Eagles have won their first ever Super Bowl, fans, media, and the team can just enjoy a nice, calm, drama-free offseason, right? Come on, now. You should know better than that. Because the Eagles have a very interesting situation at quarterback, what with the young, star quarterback (Carson Wentz) rehabbing an ACL tear, and the backup quarterback (Nick Foles) leading the team to the Super Bowl, surely there was going to be trade speculation. Similarly, there is going to be a wide assortment of speculation on when Carson Wentz will be able to play in a regular season game all offseason long. So again, in the interest of saving myself the trouble of writing a new article every single time some doctor, teammate, Wentz himself, or a miniaturized guy injected into his knee has something to say, we'll just add it here. That was via Paul Domowitch of the Daily News. Interestingly, Domo's partner in crime Les Bowen was able to get a source to tell him the Eagles feel the same way. You've all seen this by now, I'd assume, but if not, you can listen to the entire interview here. 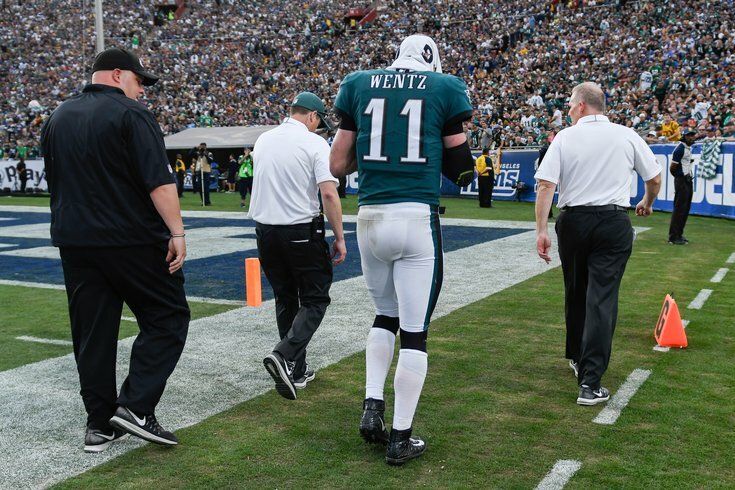 Dr. John Kelly warned that because there was also an LCL tear and other ligament damage, he would be "lighting candles" for Wentz, and to expect a recovery of "nine, ten, eleven months." Back on January 19, Dr. David Chao, a former NFL doctor who has been dead-on with many of his injury prognoses from afar, accurately sniffed out that Wentz injured more than just his ACL. He correctly surmised that it was likely that a number of other ligaments were also damaged, specifically his LCL, based on Wentz's need for a brace five weeks after surgery. "Wentz still could be on track to perform as a pocket quarterback by the start of the season. It would take longer (to mid- or late-season) to become the same run/pass threat he has been." What the two doctors are saying really isn't all that different. One had a more analytical approach, while the other spoke with a doom and gloom tone. Appearing on the Rich Eisen podcast (and transcribed by BGN), Pederson discussed Wentz's rehab for the first time since the Eagles won the Super Bowl..
"You know, we’re optimistic, obviously. I don’t want to put a time table on him. Obviously, he’s working extremely hard. He’s in the weight room, he’s getting his rehab done. He’s looking good but at the same time, I’m not going to rush him. You know, like we did with Sidney Jones [in 2017], I don’t want to put him out there if he’s not 100%. So, optimistic that, you know, that that could come to fruition. But again, we’ll be smart about it, and we’ll put him out there when he’s ready."